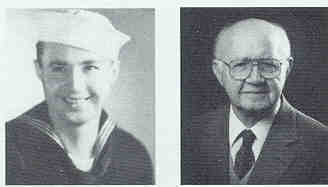 Armand F. Ancion, Water Tender 2/c, born May 2, 1912, Salem, WV, completed high school and joined the USN Sept. 9, 1943. He was stationed at NTS Great Lakes, IL; Service School, Great Lakes, IL; RS PSNY Bremerton, WA, and aboard the USS West Virginia. Memorable experiences include watching the flag raising on Iwo Jima in February 1945; sinking battleship off Surigao Strait in October 1944; and entering Tokyo Bay in September 1945. He was discharged March 31, 1946, and received the Pacific Ribbon w/4 stars, American Theater Ribbon, Philippine Liberation Ribbon w/2 start and the WWII Victory Medal. He was married 49 years to Elizabeth when she passed in 1996. He has four children, six grandchildren and two great-grandchildren. He retired from Libby-Owens-Ford Class Co. He lives in St. Albans, WV, and enjoys fishing, hunting, archeology and metal detecting.